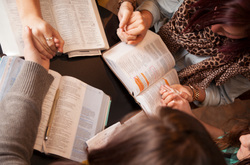 Women's Ministry at Providence are structured to provide a loving, supportive, and Scriptural environment to allow the women of the congregation to come together in service to the Body of Christ, pray for one another, mentoring and Bible studies. The foundations of the ministry include fellowship, prayer, and the Truth of Scripture. The church body at PPC relies on various committees of the women to provide meals to the sick, planning and hosting of child care, refreshments, and showers and receptions for special occasions. The Women's Ministry offers two bible studies, one that meets weekly and a separate opportunity that meets monthly. These Bible study series are chosen to foster woman-to-woman focused discussion and thoughtful consideration on mentoring the young women in the tenants of Biblical womanhood as well as helping each other grow in Christ. All women are welcome and encouraged to participate in these lively ministries.